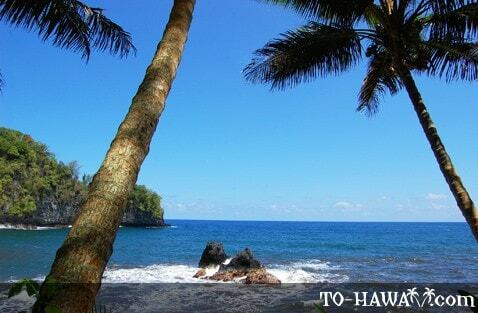 These two rocks are located in the offshore waters at Onomea Bay, about 6 miles (10 km) north of Hilo. 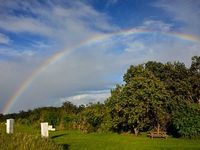 They can be seen from a nice viewing area that is located inside Hawaii Tropical Botanical Garden (admission fee is $15). This may sound steep for a botanical garden, but this is one of Hawaii's best. It's well worth a visit. The viewing area is located at the mouth of the bay. Along the way, you'll see a large variety of tropical plants and a waterfall. 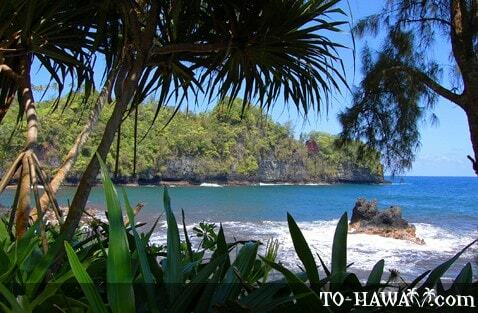 The village of Kahali'i was located on this large point of land which extends into Onomea Bay. Though the village is gone, the descendants of Kahali'i still remember some of the legends concerning the area's landmarks. One story tells of the origin of two rock formations at the head of Onomea Bay that are said to be a young man and woman, known as the lovers of Kahali'i. Legend has it that one day, a chief of the village spotted many canoes with sails heading shoreward in their direction. Fearing an attack, the chiefs and village elders held a council to determine a course of action. They decided to build a reef to prevent a landing on their beaches. Not having the means to complete the task quickly enough, they asked for two young lovers to be the guides and protectors of the village by giving their lives. Two willing individuals were found. That night a decree was sent to all who lived at Kahali'i to remain indoors from sunset to sunrise without making any light or sound, on penalty of death. In the light of the new day, everyone went down to the shoreline where they were amazed to find the lovers gone, and in their place two gigantic rock formations at the entrance of the Bay, attached to each other, as if on guard. The chief informed the people that no canoe could now pass the treacherous currents swirling around the rocks unless allowed to do so by the guardians. The lovers and their offspring still stand today, sentinels at the head of the Bay. Directions: The Twin Rocks can best be seen from a viewing area within Hawaii Tropical Botanical Garden (garden has an admission fee). To get to the viewing area, walk along the trail all the way to the bottom of the bay. There is access to the head of the bay and the inlet of the stream which can be reached without paying to go into the Botanical Garden. I am not saying skip the garden, but if you get there late, you can see the rocks and shore without requiring access to the Botanical Garden. The drive on the old highway and the hike down to the rocky shore are well worth the time. And, take your time, there is a lot to see. Many birds, plants, and nice ocean views with the freshwater stream coming to the beach.